I always feel both words 'ever' and 'yet' have rather multi-explanations. Could you please make a summary? Thank you. The two words David asks about are frequently used in everyday English. In that sense they are common words but they are not insignificant, because they help give emphasis to a question or an answer. Their parts of speech differ in different contexts. In this programme we attempt to give you a mini-summary of their meanings with specific examples. 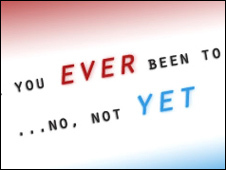 Have you ever used a sentence with 'yet'? *This is possible in US English. 1. Have you ever been to China? 2. Would you ever want to go back to university? 3. She is ever so friendly.